Art Review: "Heads, Hands & Hearts", B. Amore, sculpture. Gallery in-the-Field, Brandon. Through October 26. Vermont sculptor B. Amore typically combines ingredients as enduring as bronze and stone, but she also creates installations and assemblages that appear to be meditations on past lives. Amore’s powerful Gallery in-the-Field exhibition “Heads, Hands & Hearts” finds a personal iconography in passport-photo-sized faces, work gloves, silk flowers and embossed sections of antique tin ceiling, all infused with an air of transience. The 9-by-9-foot wall assemblage “Stepping Stones Panels” and the 12-by-12-foot floor piece “Floating Stones” appear dramatically expansive in the architecturally elegant Brandon gallery — designed by noted artist and gallerist Fran Bull. In “Floating Stones,” a square bed of crushed stone lies beneath a dozen variously sized slabs of white marble that rest on glass bricks. The marble bears straight etched lines, as if broken when it was cut, and 16 work gloves rest on top of the slabs. About 70 of Amore’s gloves appear in the exhibition, nearly all of them cast in bronze and painted to resemble actual worn-out fabric. 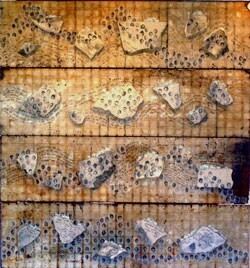 The vertical “Stepping Stones Panels” consist of four horizontal strips of rusted tin ceiling, with chunks of white marble and photos of faces. Amore wrote passages of cursive text over the design elements, which are not easy to read. Text also appears on “Mysterious Muscle,” a pink marble stone that looks like an oversized heart. The stone is nestled in a pile of white silk threads resting on a 20-by-20-inch dark aluminum tile. The word “peace” can be discerned, but Amore’s handwritten lines seem more like ambient whispers or quiet prayers than clear, declarative statements. The 12-by-12-inch “Amour, Eros, Agape II” also features a heart of stone. The heart-shaped rock is affixed in the center of the composition, surrounded by more writing and a border of small faces of silk. The motifs of hearts and faces are ubiquitous in this exhibition. As reported in a 2007 story in Seven Days, Amore captures the faces by surreptitiously taking digital shots on the streets of New York City. A piece of bone that resembles a heart appears in the middle of the 29-by-29-inch “Heart of the Matter II.” It doesn’t incorporate text, but faded pink silk flowers add color to the composition. Still more passport-sized portraits appear along the top of the piece, and, like most works in the show, the whole thing is attached to a square of embossed tin. The 2008 assemblage “Singapore Fling” is one of the few works featuring no little faces. A red rectangle of indeterminate substance contains an actual pair of painted gloves — not bronzed — and crumpled pieces of plastic. The enigmatic 19-by-29-inch mixed-media piece seems more focused on commingling diverse textures into an abstract whole than on conveying a complex narrative. Amore does tell mysterious stories with her works, but it’s their formal organization that makes them intriguing. Amore is the founder of West Rutland’s Carving Studio and author of the 300-page An Italian American Odyssey: Life Line, described on Amazon.com as “a moving blend of words and images.” She also completed a monumental installation at the Ellis Island Immigration Museum in New York, which spans several rooms. “Heads, Hands & Hearts” is an eloquent compendium of variations on technical and conceptual themes. While there are many similarities among the individual pieces, their differences keep them fresh.